Renault Pulse shares Micra’s Platform but not the looks.Renault India has finally launched its new Renault Pulse hatchback at the Indian Auto Expo at New Delhi. This car was showcased in the month of October to the Indian customers. This hatchback has been launched in diesel variant in two versions.As for the Renault pulse price, it is competitive and the variant Renault Pulse RLX is priced Rs 5.77 lakh and Renault Pulse RXZ costs Rs 6.25 lakh (ex- showroom prices). The car comes with an attractive warranty of 2+2 years or 80,000 km depending upon what comes first. 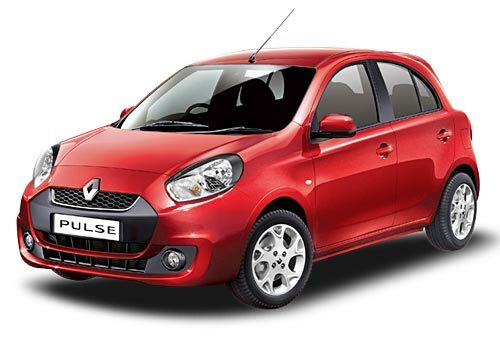 Renault Pulse Hatchback comes with a small 1.5 DCi diesel engine which gives a very good efficiency of 23.8 kmpl. This car has an all-diesel K9K engine under its hood which churns out the peak power of 64 BHP and the peak torque of 160Nm. This little hatchback shares the same V-platform with the Nissan Micra hatchback. The top version of this car RXZ comes with a lot of user friendly features like ignition button, smart keys for locking & unlocking, weather defogger along with a timer, roof spoiler, front fog lamps, 15 inch alloy wheels and many more. Since the two cars, Renault Pulse and Nissan Micra, use the same V-platform hence there are a lot of similarities between the two models. The new car has a little modification on the exteriors of the car. The outer body of the car has been modified which makes the car sportier and stylish compared to Nissan Micra. However, the interiors of the car are almost similar to that of the Nissan Micra. The central console and the dash board have a slight change from the Micra. There is addition for the function keys on the steering system and a few add-ons to the car making it a more user friendly vehicle. Rest the ride is a lot powerful and is getting a good response from the customers.